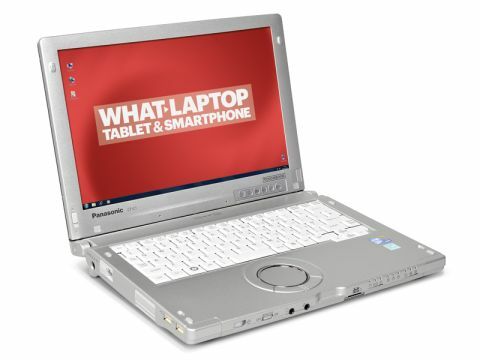 The Panasonic Toughbook CF-C1 (£1959) has been lauded as the Toughbook Tablet, but really it's an underpowered Toughbook with some dubious touchscreen technology that only niche business users will benefit from. It's been given a Sandy Bridge Core i5 2520 2.4GHz processor, which keeps it nimble, but it performed averagely in our lab tests. As this is a business laptop, the need for entertainment performance isn't applicable and the Core i5 provides more than enough power to run commercial applications. Aside from the i5 processor, the rest of the specs are disappointing, especially given the price tag. There's only 2GB of RAM, which is the bare minimum needed to run Windows properly, and you do notice the lack of physical memory. There's not much in the way of storage either, with a minimal 250GB hard drive included. This is being upgraded for a MK2 version, which will feature 4GB of RAM and a 320GB hard drive. The CF-C1 is extremely portable, and Panasonic should be applauded for making such a durable hybrid laptop so portable. It weighs just 1.7kg and it's easily carried around. There's some flex in the plastic, but this is the secret behind its ability to absorb shocks, and it can handle table-height falls and channel water away from the keyboard in the event of spillage. There are two batteries in the CR-C1 to give you longer performance, but our Battery Eater test made light work of both, draining them in 128 minutes. This translates to around five hours of general business use, but it's far from all-day computing. We're not fans of Windows 7 with touchscreen technology, and the only good examples have been skinned for a more friendly interface. We found the screen to be extremely inaccurate and we were constantly struggling to hit the tiny buttons, even using the supplied stylus. We can't think of any reason that you would use the device in its tablet form, unless you were using a bespoke business application where on-screen writing was essential. In short, this is a disappointing device which left us thoroughly underwhelmed. The Toughbook is always going to be a bespoke PC for specific applications and situations, but that doesn't disguise poor performance, a frustrating touchscreen experience and a lack of features.